This year has been a big one…. I spent time with family… changed jobs… traveled to great places… had a chance to get to know St. Louis MUCH better and got a bit of time in a couple of cotton fields. All of that has been shared here on the blog in one way or another. While I was attending a Carter Center event for work, I couldn’t help but personally be impacted. 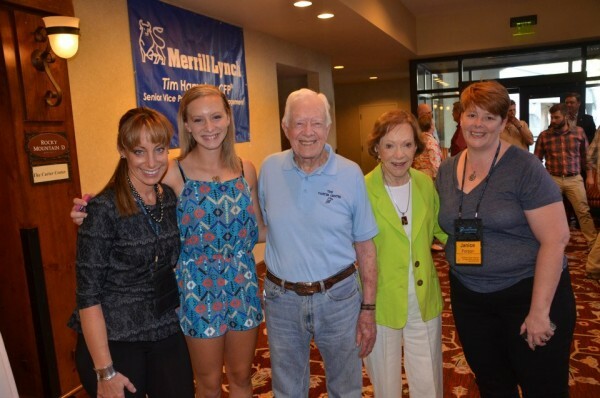 President Carter has long been a sort of hero but in an oddly accessible way. His approachful presence is something that always struck me (and BLEW ME OVER but I have followed with incredible interest the work he does to make the world a better place both as a farmer (yes he’s a peanut farmer but he also grows cotton!) and as a humanitarian through efforts like Habitat for Humanity. 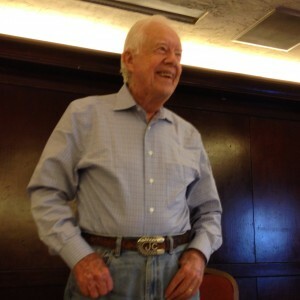 And although I had heard about The Carter Center, this weekend was a chance for me to learn a lot about the programs. The Center highlights their programs as waging peace, fighting disease & building hope. The primary program of the Carter Center I had heard about was their work monitoring elections in various parts of the world and hearing directly from the staff and people who have previously volunteered, I really would like to do this. It taps into the part of me that is interested in helping others help themselves and having democratic voting processes seem to help in this. I think the program that has probably stayed with me longer than any of the others is the work they are doing to combat a disease that comes through guinea worms in contaminated water. It is the kind of disease that will make your stomach turn when you see the impacts and most of us think has been eradicated. You can read/hear about the success of the guinea worm program on Voice of America. President Carter told VOA “We had three-and-a-half million cases of guinea worm, and village by village we have done away with it. Last year, we only had 146 cases in the whole world.” That’s massive impact in improving the lives of people! But I also was hugely connected to the efforts around women and girls. Video cleanup from the year… reminded what a champion for good former President Carter is. Loved meeting him & hearing his thoughts this summer. In fact, I had a chance to ask President Carter one question and it was to follow-up about some of the programs the Center has to empower women since women in many communities around the world are the real drivers of potential progress. It was so exciting to hear about the thoughts President Carter has that I got signed copies of his book A Call to Action (spoiler alert for a couple of family members) for Christmas gifts. By engaging religious and faith leaders, The Carter Center seeks to transform ideas about child marriage, female genital mutilation, human trafficking, and other forms of child abuse, while promoting equal opportunities in society for women and girls. How could I not give? Can you join the effort? Thank you for sharing another great year of sharing your life with all of us. I have learned a lot from you and appreciate you efforts for all of agriculture, conventional and otherwise. Wow! Thank you so much girl! I really appreciate the kind words! I wish a fantastic 2015 for you as well. Would love to catch up with you along the way.